The DISC Leadership Style of Martin Luther King, Jr. I never had the privilege of meeting or hearing Dr. Martin Luther King, Jr. in my lifetime for I was a small child when his untimely death happened. I did, however, have a History teacher in High School who loved teaching his class about pivotal times in American history (even World History for that matter). We spent a long period of time studying Dr. King and the impact of his life. Without knowing the man personally, I must rely on observation only as to what his DISC personality style may have been. The difficulty of this is the man had so many monumental moments it is like describing Lincoln for only his Gettysburgh Address; it would be incomplete. He was a “D” - He was a driver of Civil Rights. 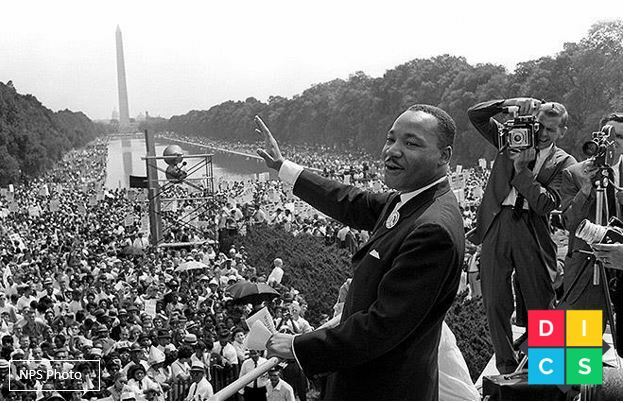 While other speeches were given that day, none stood out like the passionate plea and determination to reach his end goal -- freedom. He was an “I” – One of the all-time influential and charismatic figures of the century, and also one of the best orators of all time. He could motive and encourage the masses. history, and interwove those principals into his speech that day. An interesting sidenote, Dr. King “gave” his paper copy of the speech away that day to a young basketball player named George Raveling. George volunteered to help with security that day and was so moved he asked Dr. King for the folded up copy as he was about to put into his pocket. It was not until years later that a reporter found out about the copy George had, still tucked away in a book as one of his prized possessions. The reporter had it framed and shared the true significance of this historic document. It is reported, a couple years ago someone offered George Raveling $3,000,000 for this treasure. Now, 80 years old, George rejected the offer in favor of keeping this precious document and to perhaps someday allowing a museum or other public place of gathering to display this great work. We certainly hope you do, George! Dare to find what is your DISC Leadership Style?